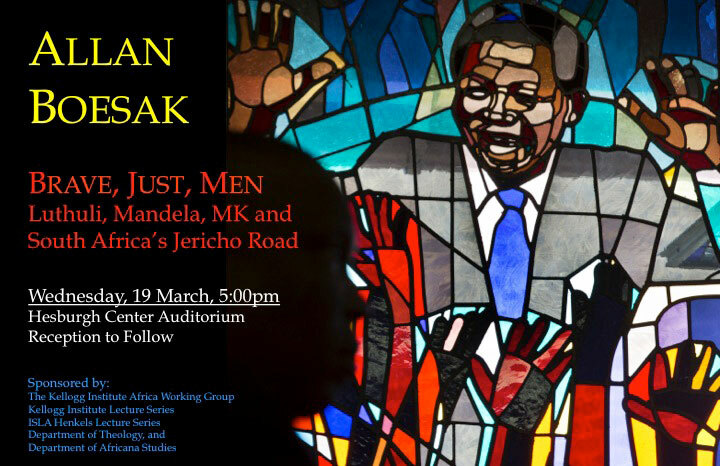 Two prominent South African participants in the anti-apartheid struggle will speak at the University of Notre Dame on Wednesday, March 19, and Thursday, April 3, as part of the Africa Working Group’s “Celebrating Nelson Mandela” series. One a liberation theologian and political activist, the other the “Jackie Robinson of South Africa,” they each played a crucial role in moving their nation out of apartheid. “It is critical that we reflect on Mandela in order to clarify our understanding of the man and his legacy at the moment when so many people remember his death, but not his life,” said Kellogg Institute for International Studies Faculty Fellow Catherine Bolten, who organized the series as co-chair of the working group. Theologian Allan Boesak, the former president of the World Alliance of Reformed Churches, will deliver a talk at 5 p.m. March 19 in the Hesburgh Center Auditorium. Boesak served as patron of the United Democratic Front, one of the most important anti-apartheid movements of the 1980s. He will speak on the moral consequences of the African National Congress’ decision to take up arms in the wake of the 1960 Sharpeville massacre. Chester Williams broke the color barrier in 1995 when he joined the previously all-white Springboks, South Africa’s national rugby team, and became the face of the team to the nation and the world in the World Cup, as depicted in the movie “Invictus.” His iconic status drew a divided nation together and, some say, saved Mandela’s presidency. Williams will speak on his life under apartheid, his rise to rugby stardom and his time with Mandela at 5:30 p.m. April 3 in the Hesburgh Center Auditorium. “Just as South Africa has the ‘born free’ generation — those born after the end of apartheid who are now in their 20s — many members of Notre Dame’s own community take for granted the freedoms people enjoy around the world, and have little concept of the struggle and the cost associated with those freedoms,” says Bolten, an Africa specialist who is assistant professor of anthropology and peace studies at the Kroc Institute for International Peace Studies. Funded by the Kellogg Institute for International Studies, the Africa Working Group provides a forum for Notre Dame faculty, graduate students, and outside scholars to present and discuss cutting-edge research on Africa. Participants from a range of disciplines share a common interest in investigating Africa’s past, present, and future, as well as Africa’s place in the larger global order. The “Celebrating Mandela” series, a year-long celebration of Mandela’s life and work, began in the fall but acquired new meaning after Mandela’s death in December. “There are many great statesmen, but Mandela was the only person who could make trust, forgiveness, and hope a seductive prospect to absolutely everyone he met. His gift was not to call a perceived enemy over to his side, but to cross that line himself, put his arm around his adversary, and walk with him,” said Bolten. The public is welcome at both events and the receptions that follow.